Ever get a phone call while you're outside pressure washing your truck? Or, maybe your dog gets out, prompting you to set the nozzle down and run after them? Releasing the nozzle and leaving the pump running could end up costing you some serious cash. 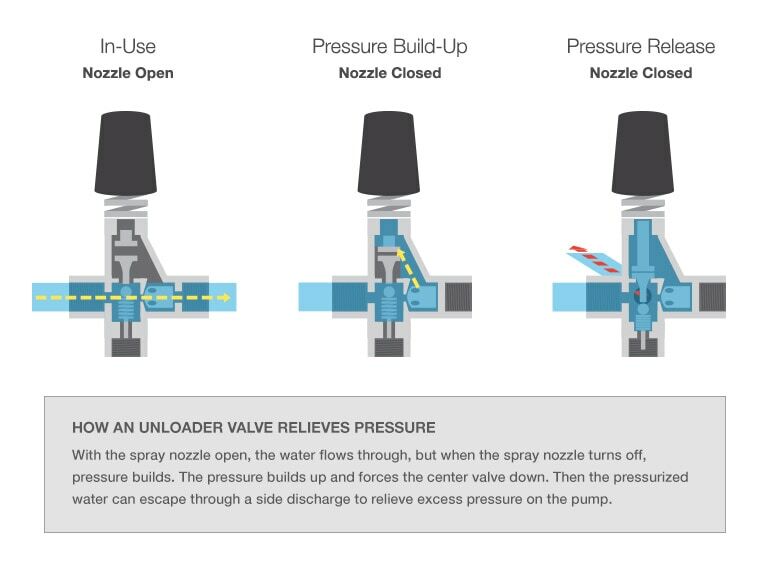 As your pump runs, it builds pressure; but with the nozzle off, there's no relief. Without any relief, the pressure is going to burn out your pump, leaving you with just a dribble and a disaster. Distractions happen, so protect your investment with a quality unloader valve to protect the pump from burning out. What's the Importance of an Unloader Valve? In a pressure washer, water is pumped in faster than it's let out. This creates the high-pressure water we use to blast surfaces clean. However, if the pressure washer gun is disengaged, and there is no unloader valve to redirect the pressurized water, the pressure would continue to build. It wouldn't take long for the pressure to exceed the components' PSI limitations, and damage the pump, gun, or hoses. Water being pressurized by the pump must be redirected once the spray nozzle closes. This is where the unloader valve comes into play. As you release the trigger on your spray gun, the pressure builds, the water backs up into the head of the unloader valve, and the spring tension is overridden, causing the water to flow past the valve ball and out through the bypass port. Once the trigger is squeezed again on the gun, the spring tension returns, the valve ball returns, and the water flows out through the gun. 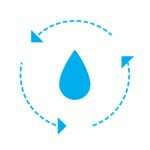 Where Does the Bypassing Water Go? When the unloader valve sends pressurized water into bypass, it gets sent via a hose to the inlet where it's recycled through the pump. The water literally circulates through the pump over and over, becoming pressurized and depressurized again and again until you release it through the gun or wand. Although this bypass is great protection for the pump and components, you should not leave it cycling for long. The friction in the crankcase will generate heat, and as the water is continuously cycled through it, the heat is continuously transferred to the water. 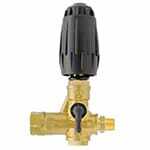 If the water gets too hot, it can damage seals and other components within the pump. To counteract this, occasionally squeeze the trigger on the spray gun/wand to release the water before it gets too hot. This will draw in fresh, cooler water and prevent damage to the pressure washer. Under Pressure.. Our Power Equipment Direct how-to library can help you learn about Proposition 65 Product Labeling, Sales Tax Information and Product Recalls for Pressure Washer Equipment.